On this date in 1769, two weavers hanged in East London in a bitter fight over wages and labor power. Spitalfields, the East London district also known as the stomping-ground of legendary jailbreaker Jack Sheppard, was the capital of a thriving English silk-weaving industry. It had attained 18th century prosperity thanks in large measure to the decision of William and Mary to invite Lyons Huguenots being hard-pressed by the French crown to relocate their talents across the channel. This now-domestic industry* quickly began supplanting formerly dominant French imports. 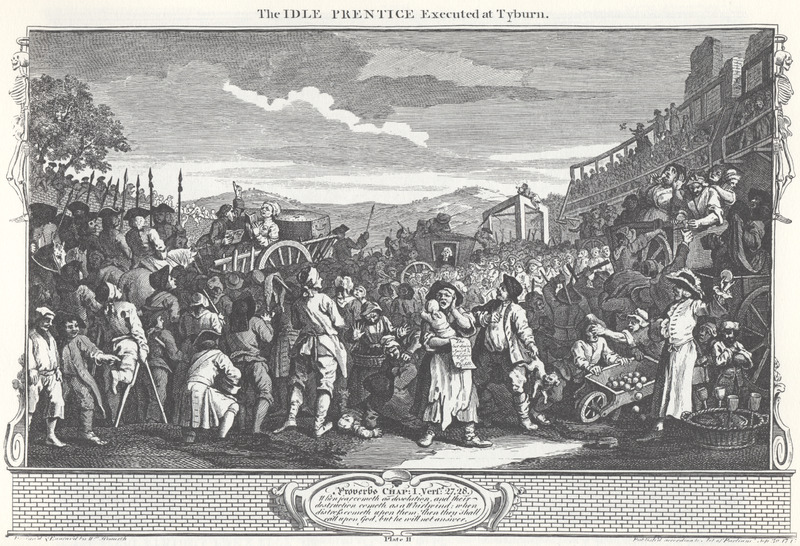 In this roaring and prestigious business, William Hogarth situated his 1747 Industry & Idleness plates: both the Industrious Prentice (eventually destined to become Lord Mayor of London) and the Idle Prentice (eventually executed at Tyburn) start off shoulder to shoulder at the Spitalfields looms. But as the 18th century unfolded, even the most industrious Spitalfield weavers came under increasing competitive pressure especially from Chinese and Indian imports. Although Parliament attempted to ban textile imports to preserve the domestic industries, Spitalfield workers were known to enforce their prerogatives directly by attacking people in the street thought to be wearing foreign prints. This simmering tension came to a rapid boil after settlement of the Seven Years’ War enabled England and France to resume trading — and a glut of French textiles to undermine weavers’ price controls. Conflicts were no less fierce within the weavers’ community, between masters and laborers. Workers combined to maintain wages by attacking those thought to be undercutting prices. In September 1769, one such action punished a wealthy anti-“combination” (for “combination”, read “labor union”) manufacturer named Lewis Chauvet, and cut the silk handkerchiefs right out of his looms. From Season 3, Episode 2 of the BBC drama Garrow’s Law, which is directly based on this case. As of this writing, the entire episode can be found on YouTube. Cutting silk from the loom was a rough method of enforcement by the labor combination. It had also been made a capital crime a few years before. And it turned out that Chauvet was ready to make his the test case. Manufacturers’ purposes were served just as well whether innocent or guilty. The point was labor discipline, not a few lost hankies. Accordingly fixing “to strike Terror into the Rioters”, the crown ordered the execution to occur not at the Tyburn gallows, but right in the weavers’ backyard, adjacent Spitalfields at Bethnal Green. This order actually delayed the sentence for the judiciary’s consideration of the minor point of whether this was allowed at all — since the actual boilerplate sentence read from the bench had specified “the usual place.” The wisest magistrates of the land considered the matter and in time agreed that “the time and place of execution was no part of the sentence” and therefore subject to His Majesty’s discretion. Bethnal Green it was. They were therefore this morning taken in a cart from Newgate through the City to Whitechapel, and thence up the road to Bethnal Green, attended by the Sheriffs &c, with the gallows, made for the purpose, in another cart; it was fixed in the cross road, near the Salmon and Ball. 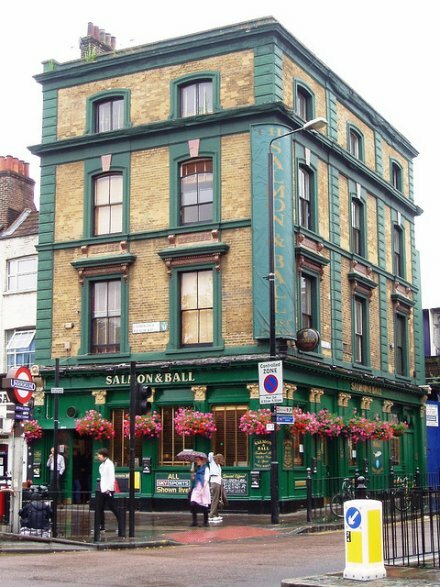 The Salmon and Ball pub, where the execution happened, today. (cc) image by Ewan Munro. Vengeful weavers having their noses rubbed in their comrades’ executions smashed up Chauvet’s house in the riots on this date, and the powers that be decided that one hanging-day at Bethnal Green was plenty. A few other rioters convicted as confederates of Doyle and Valline were put to death at Tybun later in December 1769. Years of violent labor conflict were finally quelled with the 1773 Spitalfield Weavers Act, a political compromise which protected the domestic industry from foreign competition and enabled magistrates to set wages. Though this act stabilized a tense domestic situation, its effect over several decades was seriously problematic: a protected monopoly with wage-controlled workers maintained an increasingly obsolete system of labor-intensive manufacture that fell behind power looms coming online elsewhere. doing now, exactly what his grandfather did. Nothing would induce him to use a simple improvement (the ‘fly shuttle’) to prevent the contraction of the chest of which he complains. Nothing would turn him aside from his old ways. It is the old custom to work at home, in a crowded room, instead of in a factory. Disallowed from taking lower wages even in bad times (or when cheaper cotton started displacing silk), many weavers sat completely unemployed instead — gradually sinking into a proletarianization they had fought to avoid. Spitalfield weavers eventually became one of the classic case studies in the laissez faire economics canon. * Just to be clear, Huguenots weren’t the first silk weavers in Spitalfields; it’s just that their arrival let the industry take off. At noon upon a cold and snowy day, 16 April 1771, [Chauvet’s paid witness against the weavers] Daniel Clarke … went walking in Spitalfields. It had been sixteen months since the hangings of the cutters whom Clarke had sworn against, and he must have thought the people cowed or forgetful. He was recognized. ‘There goes Clarke, that blood-selling rascal,’ was the shout, and instantly a small crowd gathered to badger and pester him. He took to his heels and found temporary refuge in the house of Mary Snee. The currents of popular memory run deep; now they flooded to the surface. A hundred people beset the house hurling maledictions. ‘They would hang him, or burn him, or stone him,’ said Mary Snee. He was cornered, stripped and dragged by his feet into the street, where he was led by the neck on a parade of humiliation. The crowds grew. Widow Horsford [wife of one of the weavers hanged later in December 1769 at Tyburn] was seen to ‘jump out of the loom’ at the news Clarke was cursed and dragged to the brick-fields. Children pelted him with dirt. Bespattered with muck, he was thrown into a pond where he was ducked within a breath of drowning. He was removed to a sandheap, buried, dug up and returned to the freezing water. It was estimated that the crowd numbered 3,000. While he could speak, he taunted his tormentors, saying ‘he would take twenty of them’. Widow Horsford said, ‘Clarke, Clarke, I am left a widow, my children is fatherless on account of you.’ Clarke answered, ‘Chauvet is worse than me,’ and then he expired. A grim ending that would be remembered for generations.